Built 1865 by Frits W. van Gendt and W. C. van Waeyen Pieterssen for the city of Arnhem. Opened 1865 with J. J. Cremer's "Emma Berthold". 1914 rebuilding. Destroyed by a fire in 1934. In 1938, a new Stadsschouwburg was opened on the site. 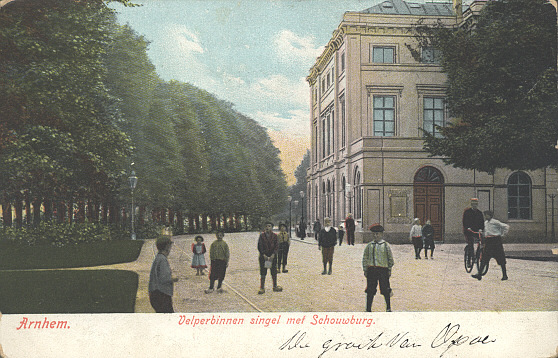 Front Text: "Arnhem, Velperbinnen singel met Schouwburg"